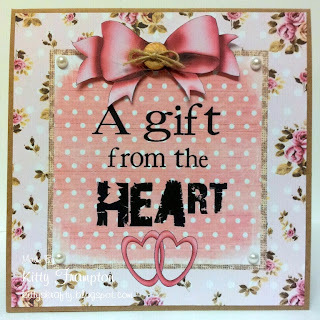 Morning to you all this is my first post over here, I am sharing with you a card I have made using the first Studio 12 Picknix collection 1 Cd. I love these shabby chic papers and I have a soft spot for all things sewing, so I have layered up elements from the CD and then cut out and layered up the manequin, tape measure and spools of threads. Pop over here to my blog for more details. Further details of how this was made and what products I used can be found on my blog HERE. 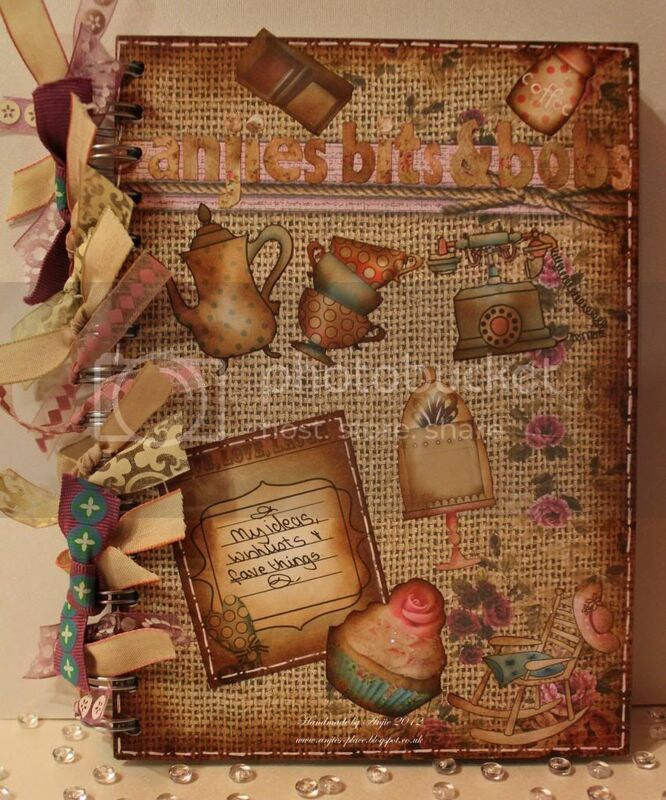 I designed the whole project on Craft Artist using various elements from Picknix Volume 1. As it is a bookmark it needed to be pretty flat as i am one of those people who hates bent pages in books, i like them all flat nice and new! So all i did was print it out as it was then layer it onto another paper. 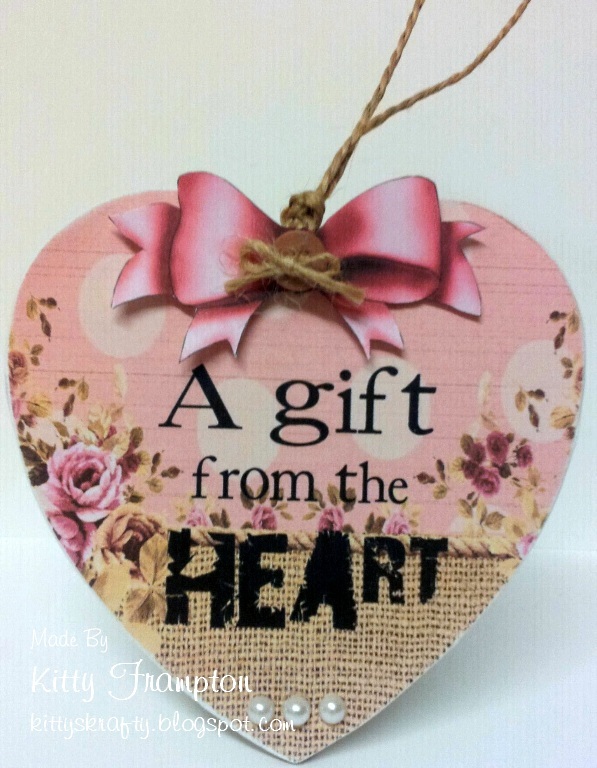 I then added some pink twine to give it a more homemade rustic feel to it. It's Friday so that can only mean a new Polkadoodle challenge! First place - Cindy - you win 3 Downloads and please use the code PD1W0402 to claim your prize. The deadline for the challenge is Sunday 3 February at 12noon GMT. Good luck! The winner of this challenge will win a Colour Therapy DVD and two runner ups will win a download each! Ruth: I've taken a trip back in time and used Sugar Birdies for my inspiration! I printed the butterflies out then cut them out (adding stickles to the outer edge) and layered it onto another circle card base. To make the scalloped edges I punched out lots of black hearts and layered them so you can just see the top bits! A few pearls here and there and some ribbon from my stash. Anne - I opted used 'In The Garden' from Studio 12 Picknix Collection 1 for my card this week. Layered it all up in my graphics programe, fiddled with it, fiddled some more then printed it out and stuck it onto a card front. I then added a little bit of stickles to some of the petals and the job was done. 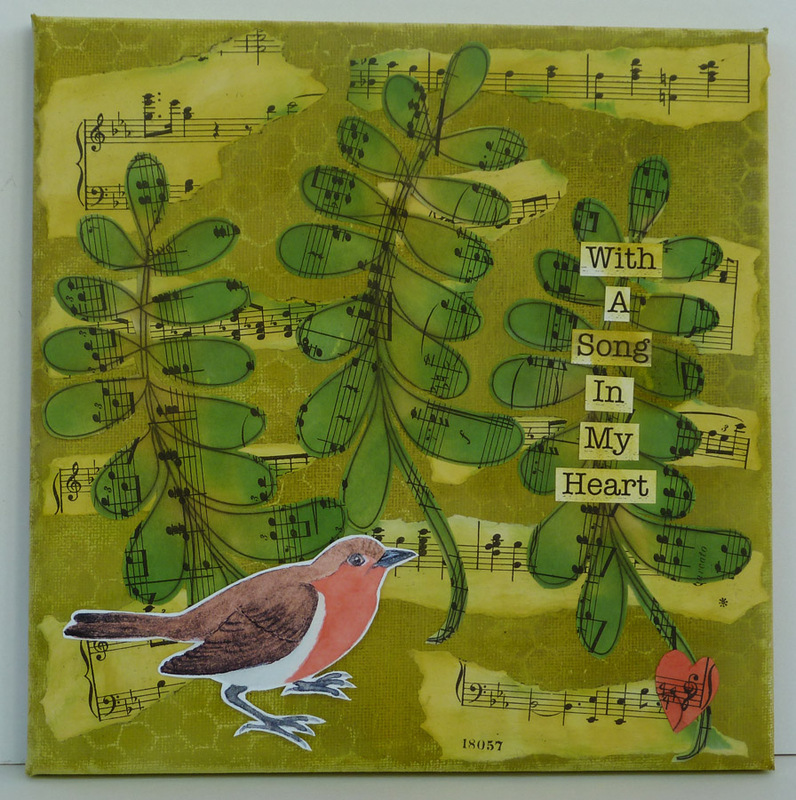 Margaret- I have used Flowers and sentiments from the Sugar Birdies CD and the image is from Back to nature "shake a tail feather " section, as is the backing paper which I have grey scaled before printing. 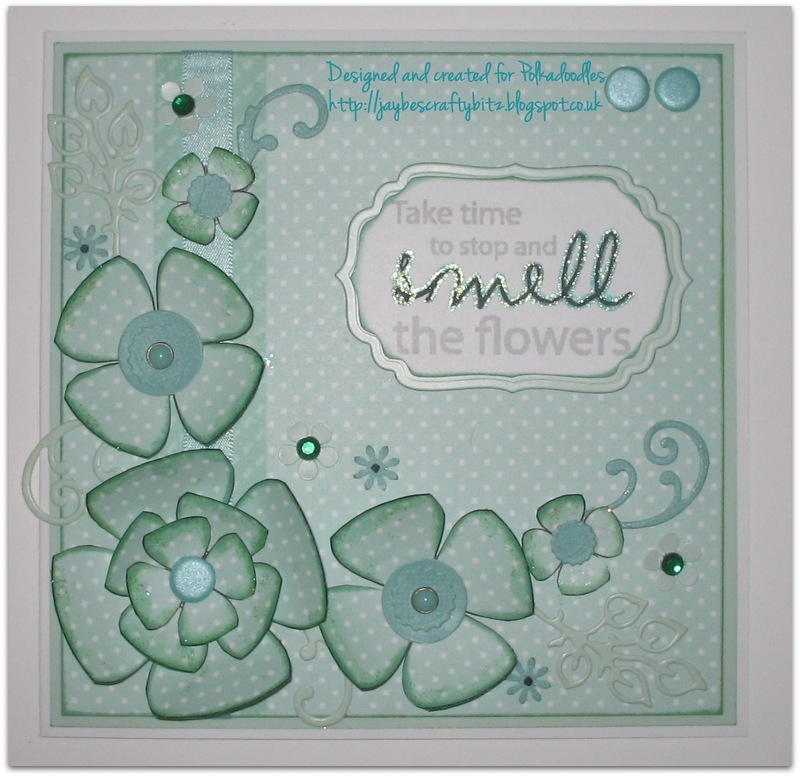 I have used the Mariannedesigns open flowers LR 0133 and card candie "Ritz" and then sprayed the lot with a bit of bling. Lucy ~ I printed this Polkadoodle paper off AGES ago and have been dying to use it. So for this theme I thought it was perfect. I have kept in quite simple. The stamped sentiment is from the Sensational Sentiment stamp set. Anjie It's not often I do black and white for a monochrome challenge but thought I would this time. The image and papers are from my fave Polka Doodles CD the Candy Doodles Collectors Edition. I've coloured the image using Copics and ProMarkers. 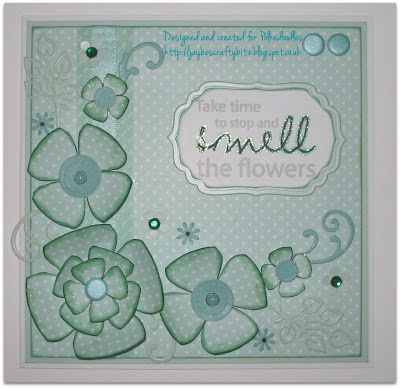 I've made flowers using the Marianne D Creatables LR0162 die, using a circle punch and have also made my own ribbon flowers. 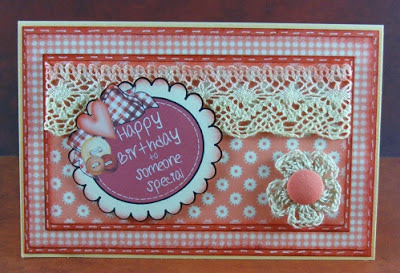 I've also used a border punch, a bit of lace and a bow from my stash. Shell- for my card this week I wanted to go vintage, so I used tones of brown for the Monochrome theme. The stamps is from PPC 4, I used only 7 copics from the E family to colour the image, the papers are from the Sugarplum Daisy CD, I then added a few pearls and flowers to finish off the card. Clare - I have made a tea light holder card for my project this week. 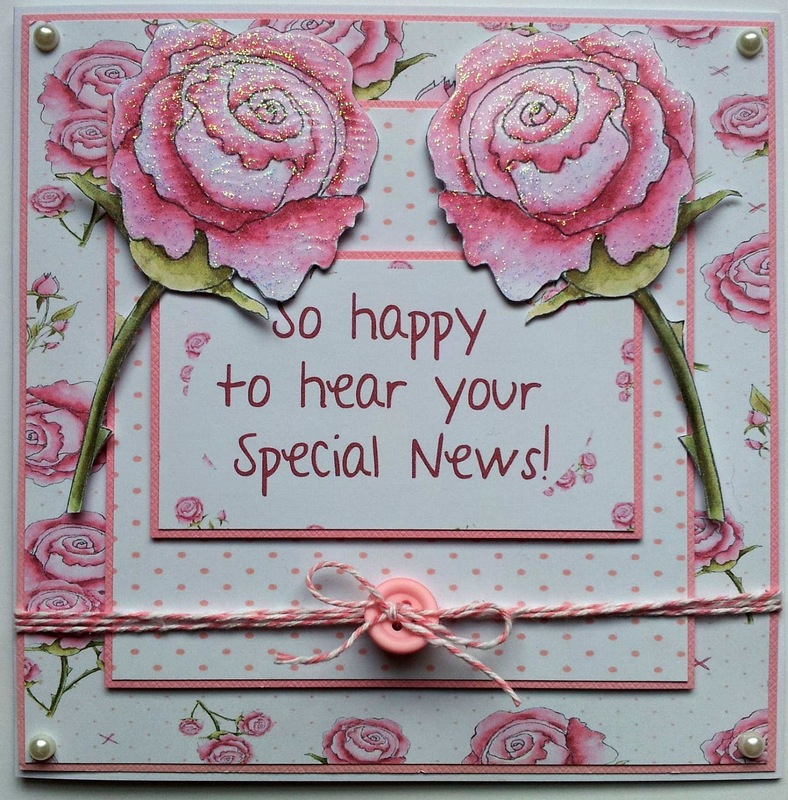 The gorgeous papers, images and sentiment is from the brand new Cherryblossom Lane CD. I have added Silver Stickles Glitter Glue on the butterfly wings and the centres of the flowers. 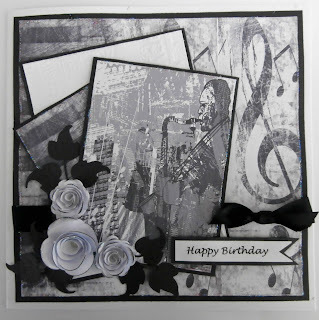 JAN: I have made a card for my monochrome themed project this week. 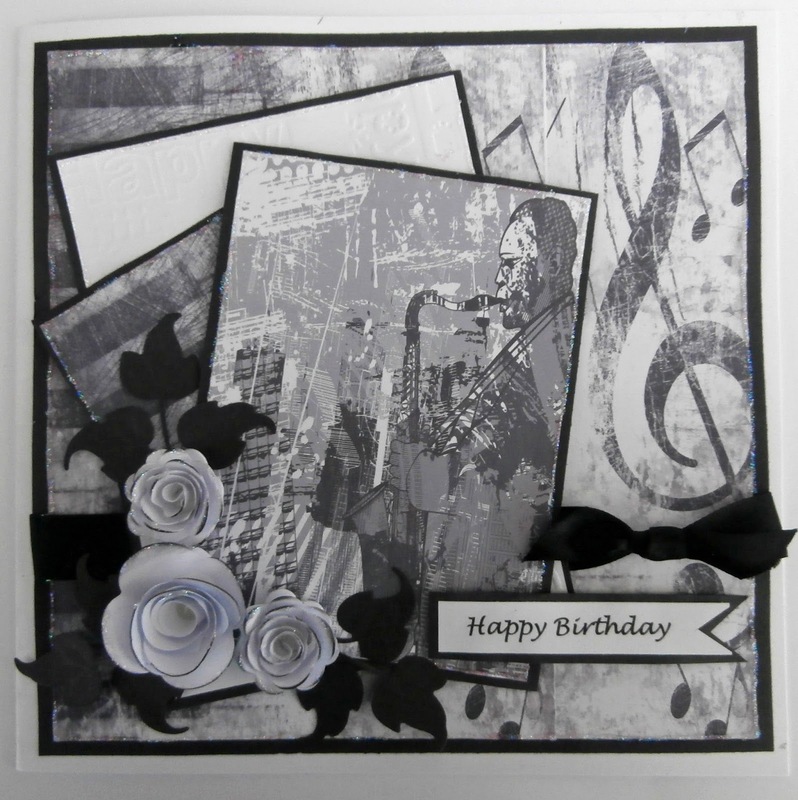 The paper, sentiment and gorgeous flowers are all from the 'All Around and Everywhere' CD. I have used some of the flowers on their own and layered the big one up, adding some ink and a bit of glitter around the edges for extra effect. Eva - I have used this cute image from the new Cherry Blossom Lane CD. The flowers are also from there. I coloured these in Pro Markers and added some glitz with a Sakura pen. I used plain black and white cardstock and added a couple of black stick on pearls. 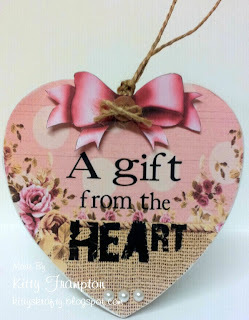 The sentiment was stamped with my mini alphabet stamp set from Hampton Arts. Lizzie - For my card I have used the CD Not for girls, a Marianne die for the leaves called Open Flowers. I made the flowers, used some ribbon and glitter glue from my stash! Hope you like it!!! Kitty - I decided to go with an all pink theme! All the elements on this card are from the Cherry Blossom Lane CD. I simply added some twine, a button and pearls..oh and some glitter! Good luck with the challenge - deadline is Sunday 3 February at 12noon GMT! And please remember our rules! 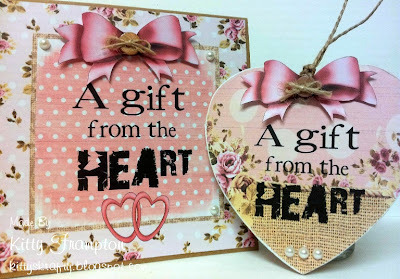 Hello Crafters, it's Dee here with a cute little canvas for you. I applied acrylics paints in pinks and greens for the base then added some spots with a pearl paint dabber. I scribbled round the spots and added some strings of dots with a pink Promarker to add some interest. 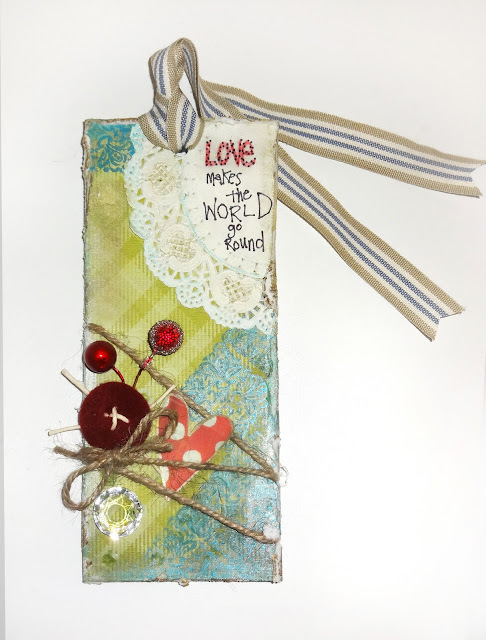 The Flower, signpost, sentiment, leafy sprig and backing paper are all from the Studio 12 Heavenly Garden Collection (one of my faves). Some distress ink round the oval just helps 'lift it off' the canvas background, some bakers twine and buttons just finish the piece off nicely. Don't forget to check back on Thursday for the next Studio 12 make, and Friday for the Polka Doodles challenge, plenty of inspiration for you all from the uber talented Design Teams. My card is very simple with an embossed hearts background and using a grouped image I had previously made in Craft Artist using "All Sewn Up" embellishments from the Studio 12 Picknix collection. However the only paper I had left was several squares and I didn't want to just matt and layer them so, I turned them in to chevrons instead! They are so easy to make and I think look so effective. Now plan out your chevron design and where possible don't match the design up ...! This is a great way to use up your paper scraps, although slightly time consuming but isn't it great to try something different every now and then? So what will you do with your scraps today? Hello folks, hope you're managing to keep warm in the current chilly weather, or at least those of you in the UK as the weather elsewhere is a bit unknown to us here! It's Friday again so it's time for a new challenge but don't forget that there are still a couple of days to go on our Blog Hop challenge of last week using a really sweet free digi exclusively designed for us by Emma Canning - you'll find the link in the sticky at the top. First place - Debbie Johns - you win 3 Download Bundles and please use the code PD1W0301 to claim your prize. A tie for second place between Mi (Crafty Bit) and Manuela - you both win a Download Bundle and please use the code PD2W0301 to claim your prizes. Congratulations to you all. Please email Nikky with your postal details. 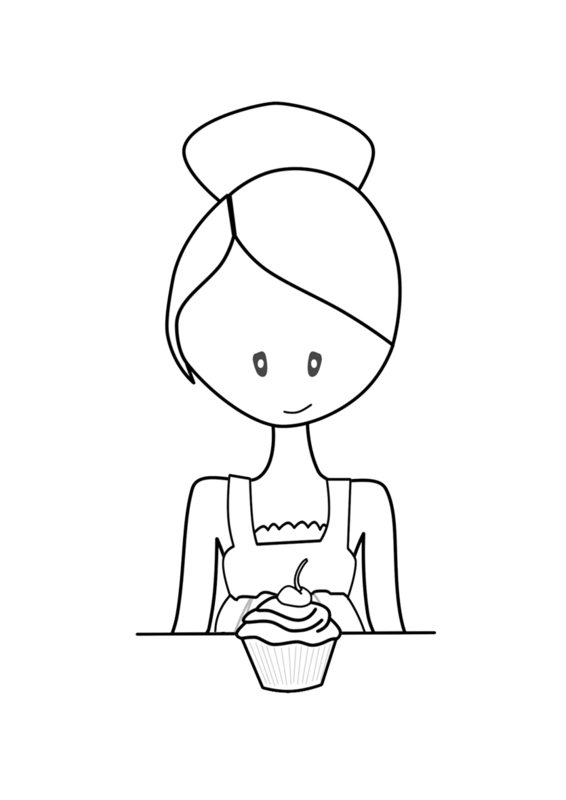 We have some very special prizes this week as our Nikky is celebrating her birthday so the fabulous first prize is a £30 Goodie Bag! The second and third placed winners will each receive a Hoots Download Bundle. Now for some gorgeous Design Team inspiration! Good luck with the challenge - deadline for entries is Sunday 27 January at 12noon GMT. Anjie For this weeks challenge I've used an image, sentiment and papers from the fabulous Candy Doodles Collectors edition CD. I've pierced around the edges with my pokey tool and then drawn on faux stitches. I've coloured the image using ProMarkers and added a few buttons and a ribbon. I've kept this card quite simple as I usually do with male cards. 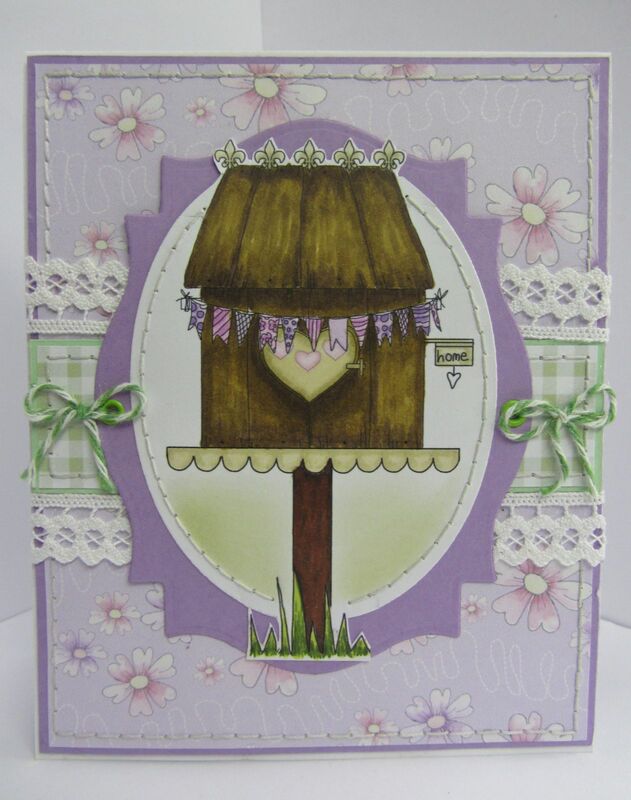 Asha - This week I'm channelling spring and made a "New Home" card with these fresh and beautiful papers from the Cherryblossom Lane CD. The pretty birdhouse image is from the In The Garden CD and I coloured it with alcohol markers. There's plenty of stitching and lace and teeny tiny twine bows to make the love-birds feel at home. 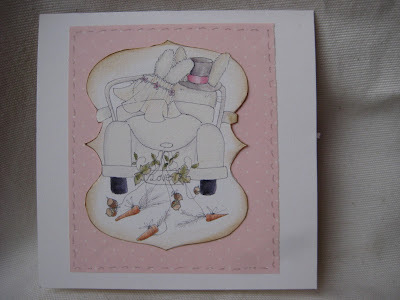 Sally - This week's challenge is Stitching and Lace so this is my card called "Put Your Feet Up!" I decided to look at the Cherryblossom Lane CD for inspiration. I found this lovely image of Mr. Bunny in his PJs, so I went from there. I printed out the gingham pattern onto textured card stock so it looked like material and cut out a duvet and pillow using my Spellbinders dies, edged it in lace and put faux stitching around it. 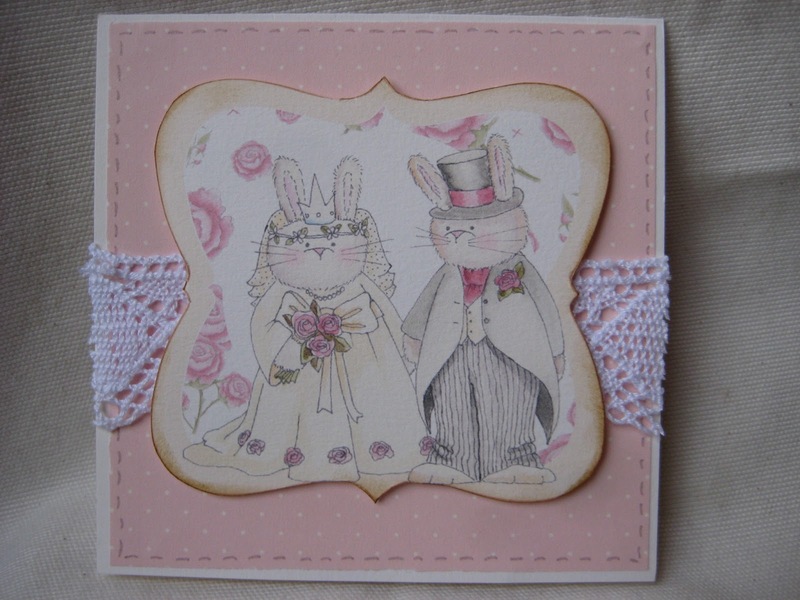 The hessian dotty background came from Picknix 1 CD in the Welcome Home papers. 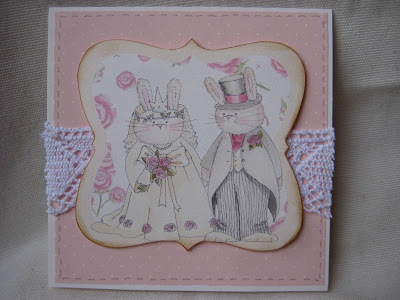 I added three ticket sentiments also from the Picknix 1 CD and coloured them with pan pastels. Karon - For this weeks challenge I was quite surprised to actually find lace in my stash! I used papers and the sentiment from the Sundae of Seasons CD - such pretty colours and shapes for all the different seasons. I went for something to remind me of Spring because we have so much snow on the ground at the moment. I inked all the edges of all the layers, added a little faux stitching around the edge of my orange layer. And then added a little crocheted flower and button to finish off. Miria This cute couple of bunnies from the Cherryblossom Lane CD is just perfect for my quick and easy wedding card , the paper is from the same cd. I decorated the back with another coloured stampie, added some faux stitching with Silver Wink of Stella and some lace, that's it! Fliss I've gone all cute for my card this week and I've used a pre-coloured image as I'm a bit short on time at the moment. The cute bunny and all the other elements on my creation are from the gorgeous Cherryblossom Lane CD. My paper has stitching in the design and I added faux stitching with a bright pink gel pen. I added some pretty lace on either side of the image panel and finished off with the lovely butterfly. So there you have it! The challenge runs until 12 noon on Sunday 27 January and good luck! 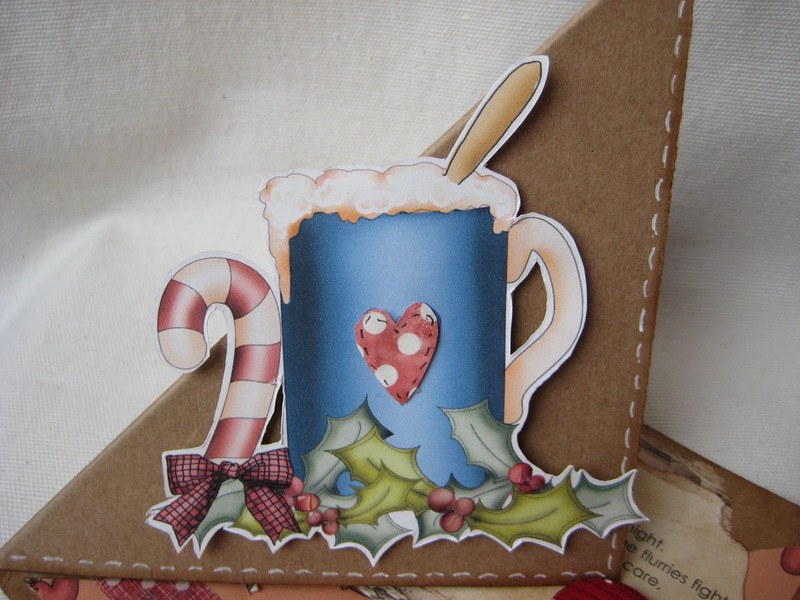 Hello folks, it's Fliss here today to share a canvas with you that will show you that the gorgeous little robin from the Studio 12 Picknix Collection 2 - Gingerbread Twist CD isn't just for Christmas lol. I've gotten very inky and painty here and still have green fingers (not from gardening you understand!) and hope you like what I've created. To begin with, I painted my 20cm square canvas with a shade of acrylic paint called Early Spring Green - can you tell what I'm longing for?! I then used a chicken wire stencil to apply green gold and olive green acrylic paints. As this looked a little darker than I wanted, I added a light wash of the spring green watered down to soften the effect. I then printed out one of the fern digital stamps from the Heavenly Garden section of the Picknix Collection 1 CD on to some vintage music score. I coloured the fern with Crushed Olive and Mowed Lawn Distress inks using a cosmetic sponge and cut them out when dry. 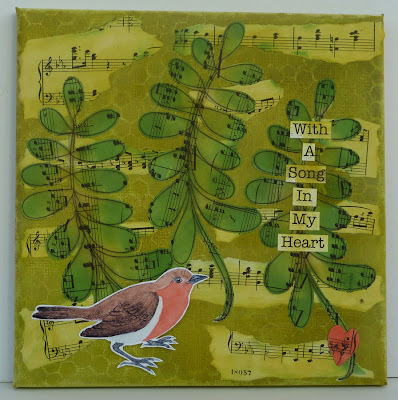 I then tore up some of the scraps of leftover music score and glued this to the canvas before sponging on a little of the Crushed Olive to blend the paper in. I glued the fern fronds on top. To finish, I added the cute little robin using my favourite trick of adding foam tape near the top of the image and double sided tape at the base which gives a very realistic look to the little chap. I added some computer generated text inked with the Crushed Olive and a small heart trimmed from the leftover music score coloured with Barn Door Distress ink. Stay tuned for another project from the Studio 12 teamies on Thursday. Don't forget that there's 15% off at the Polka Doodles Online Shop at the moment so now's the time to stock up on those wish list goodies! Today i have a valentines themed project for you. All the elements on these items are from the Welcome Home collection on Picknix Vol 1. Don't forget you can save 15% Off at Polka Doodles now! Week 2 - Emma Canning Blog Hop and Free Image! It's Friday so that can only mean that its time for a brand new challenge here at Polkadoodles! And for the second week running (we are good to you!) we are offering an exclusive Emma Canning Digi FREEBIE that you can download instantly plus prizes as we are having a blog hop again! The images for the hop have been drawn exclusively by Emma just for us - and for you! And if you like the look of the freebies, why not treat yourself to some more - prices for a single image are just £1.25! As with last week, you MUST use the freebie image and link up your creation with the widget at the bottom of this post AND complete the hop, leaving a comment at each stop as you go. 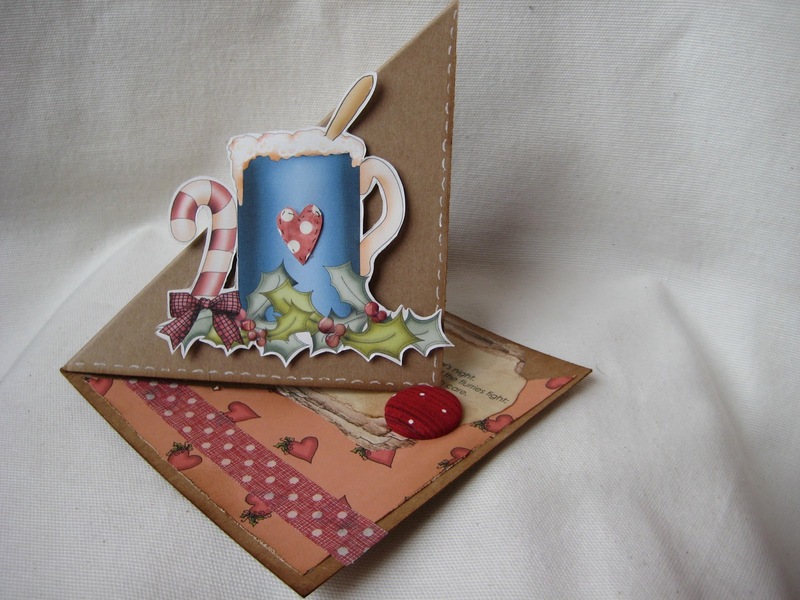 You don't have to make a card - you can make anything you want just as long as you use the freebie image. To download the image, click to make it larger then right click and then save onto your pc. The lucky winner of the Picknix vol 1 is Lisa-Jane! Congratulations!! Please email Nikky with your postal details. Please remember to add the verification code and the challenge week in the subject field on your email - you must use the code PD1W0251 to claim your prize otherwise we cannot release it. Our second place entry is: Athina - please email Nikky with your postal details as you have won a copy of Back To Nature cd you must use the code PD2W0251 to claim your prize otherwise we cannot release it. And third placed entry is Debbie Johns. And your code for your copy of Sundae of Seasons is PD3W0251. The winner of this challenge and blog hop - remember you MUST use the freebie image AND complete the hop (leaving comments at each stop) to qualify will win 3 download bundles, the second placed entry will win 2 download bundles, and the third placed entry will win one download bundle! Good luck with the challenge - deadline for entries is Sunday 20 January at 12noon GMT. Right, back to the hop! The order for you to hop is as follows and please remember to leave a comment on each and to enter the challenge! Good luck! And if you need any inspiration in using the freebie image, then look no further - see what the fab Design Team have come up with! 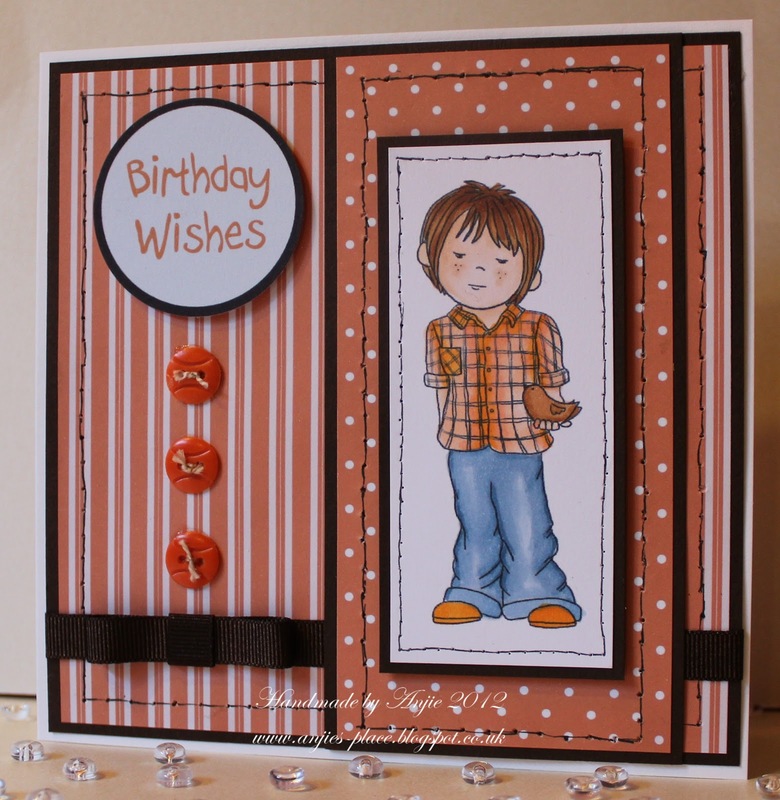 Ruth: I've kept mine quite simple and used Promarkers to colour the fab image from Emma, glitter glue, fancy dies and papers from Sugarplum Daisy. I even found some spotty ribbon in my stash and a rather cute cupcake brad! The ticket stamp is from the Pen and Paper Circle Club issue 5 magazine. The brown card is from my stash along with the half pearls. Anjie - For this card I have used the fab free image from Emma Canning, which is coloured with ProMarkers. The papers are from the new Cherry Blossom Lane CD. I've cut out a few more flowers from the paper and glittered and decoupaged them. I've used a punch on the bottom of the card and also decorated the inside of the card with the same papers. I've finished it off with some faux stitching. The papers are from the Gingerbread Twist CD. I have coloured the image with a mixture of copics and promarkers, the tickets are from the Sugarplum Daisy CD. I have added a few stitches around the finished image and some dots to the tickets, then added a few pearls and flowers to finish of the card. Margaret - I have used the lovely Emma Canning free digi image and coloured her with Promarker pens, all the background papers, sentiment ticket and the flowers are made using the newest of the Polka Doodles CD's Cherryblossom Lane and a couple of brads from my stash, with a bit of bling using Stickles Glitter Glue. Anne - I've used papers from the Sugar Birdies CD and coloured Emma's lovely image with prisma pencils. 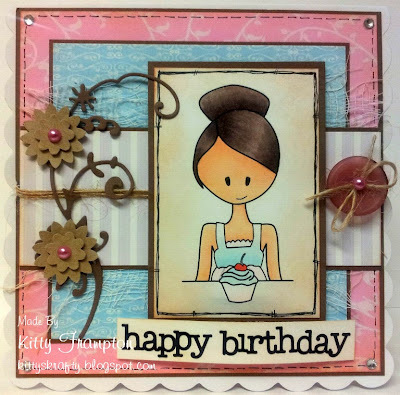 Kitty - For my card i used the gorgeous free Cupcake image from the uber talented Emma Canning! 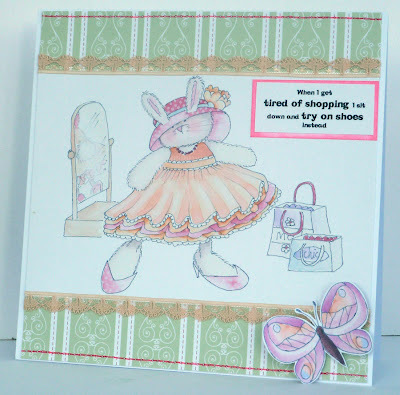 The papers are from the latest gorgeous collection Cherry Blossom Lane. The flourish is by Marianne Design which you can find here. 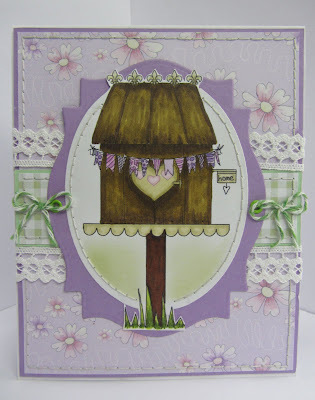 Lou - I have also used the gorgeous FREE cupcake image from Emma Canning and the papers are from Cherry Blossom Lane CD. 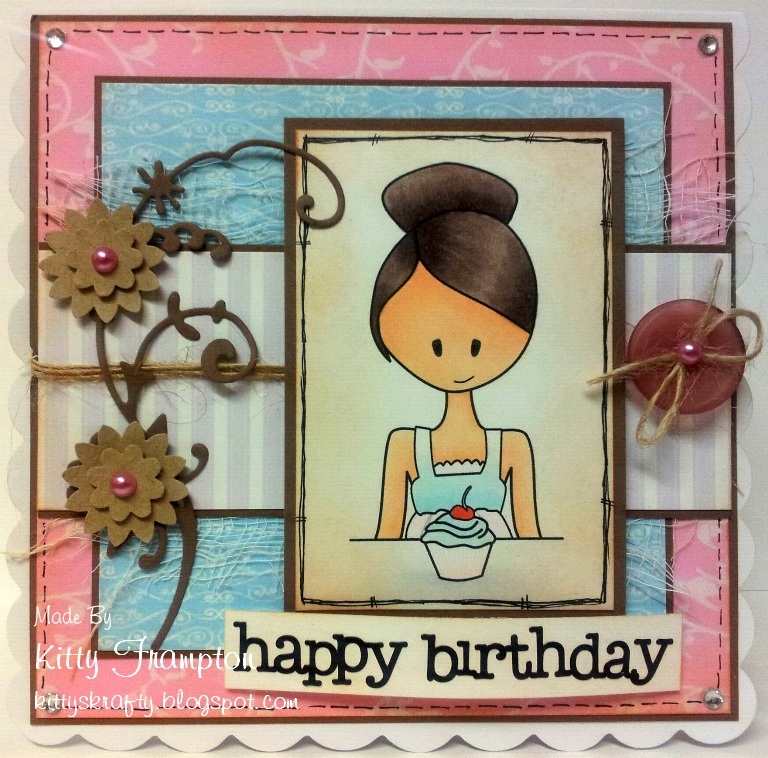 I have embossed the background and added offcuts of ribbon, finishing the card off with some diecut stars. Clare - Yes I too have used the gorgeous free image from our lovely Emma Canning. The red gingham paper is from the brand new Cherryblossom Lane CD. The yummy cupcake images are from the Sundae of Seasons CD. I have coloured the image with Flexmarkers and added Red Berry Doodle Dewdrops. Good luck with the challenge and the hop - deadline for entries is Sunday 20 January at 12noon GMT. 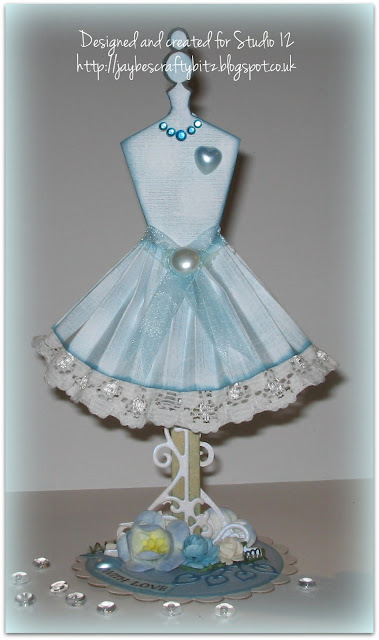 Hi, Miria here with a new creation for Studio 12 at Polka Doddles. 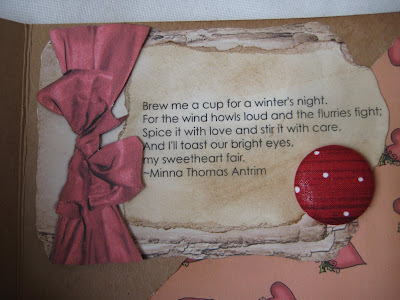 I made a twisted easel card using coloured images and quote from cd Picknix Collection 2 Gingerbread Twist , the paper is from cd Here comes Christmas. I printed the quote and tore and distressed the page to let it look like the the book stampie. I added a handmade button, some washi tape and faux stitching as a final touch. 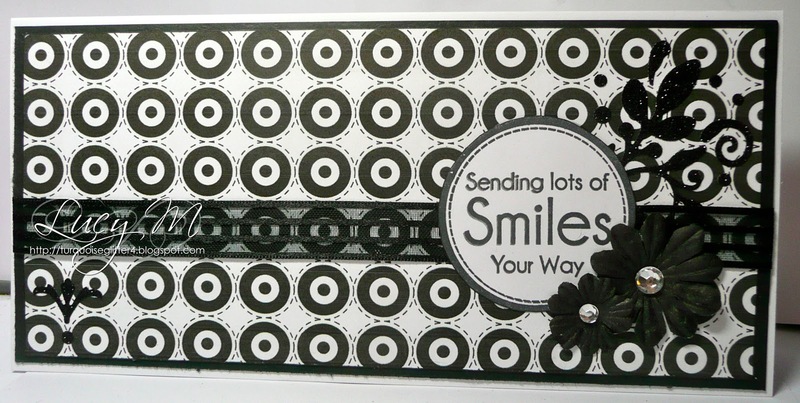 This is my first make for the Studio 12 side of Polka Doodles, although I have been using the CD's for a while! I love altering things and getting inky and messy, so it's right up my street. Every few years I do myself a journal for keeping track of things I'm working on, my fave things and things I need to own! lol And here is the one I've made for this year. 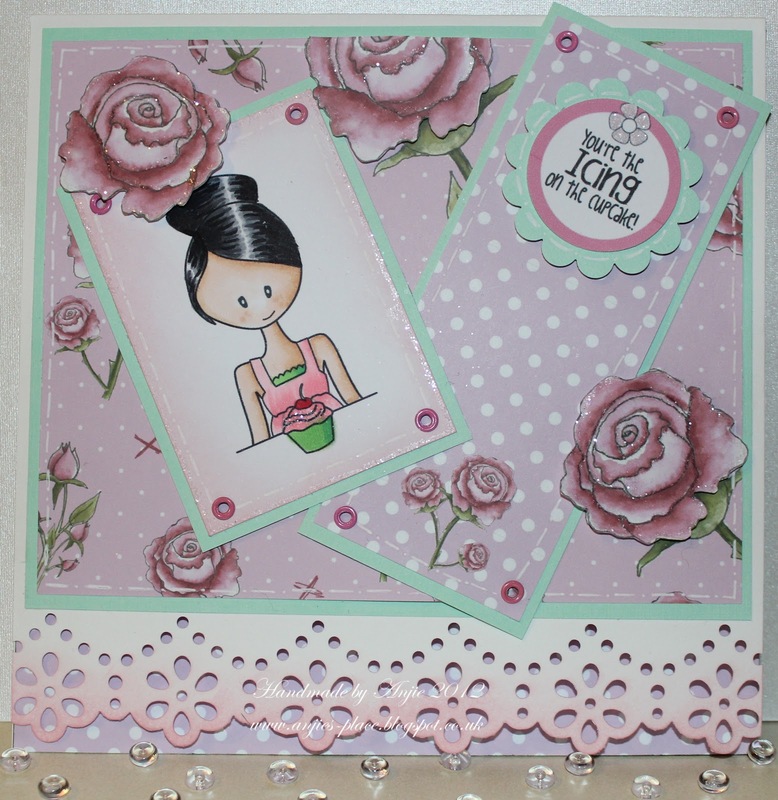 All the papers and embellishments are from the Studio 12 Picknix collection Vol 1. I've used some distress ink to age everything, then used a white pen to add faux stitching. Then I've added some odd bits of ribbon to the spine. I always save my ribbon offcuts to use on projects like these. Don't forget there is still a 15% sale on the Polka Doodles website, so go grab yourself this fabulous CD and anything else you might need. New Year Sunday - New Us! You may have noticed a little change here on the Polkadoodles blog (see our new header above!) ...we have decided that as most of our customers and followers love both Polkadoodles AND Studio 12 it makes sense to bring both of our fantastic design teams together in one place! So from now on, this blog is dedicated to the whole Polkadoodle House and we will feature some fantastically creative Studio 12 makes every Sunday, Tuesday and Thursday! Of course, our regular Polkadoodles challenge will always publish on Fridays too, it just means we can bring everyone loads more inspiration all under one bloggy roof! So to kickstart us off with Studio 12 and give you an introduction if you don't know what it's all about - my creative vision for the Studio 12 brand of products is to try and show you how digital crafting doesnt' have to be just about simply colouring in a digistamp with alcohol markers and making a card! Digital is so exciting, and let's face it - it will eventually be the future for all of us, even those who hate computers and will never give up stamping! I never ever thought I would be a digital crafter as I was a die-hard stamper and grungey person, but digital can hold it's own against all our traditional products too. It's all about opening our eyes to the possibilities of how we can use it - digital doesnt mean keeping it all on screen, which is what digiscrap tends to be - to me, it just means digital design which can be used in a variety of ways, and for me, that means 100% hybrid all the way! I will NEVER give up my rubber stamps and inks and paints and all that lovely texture which you simply can't do digital (although we do come close!) 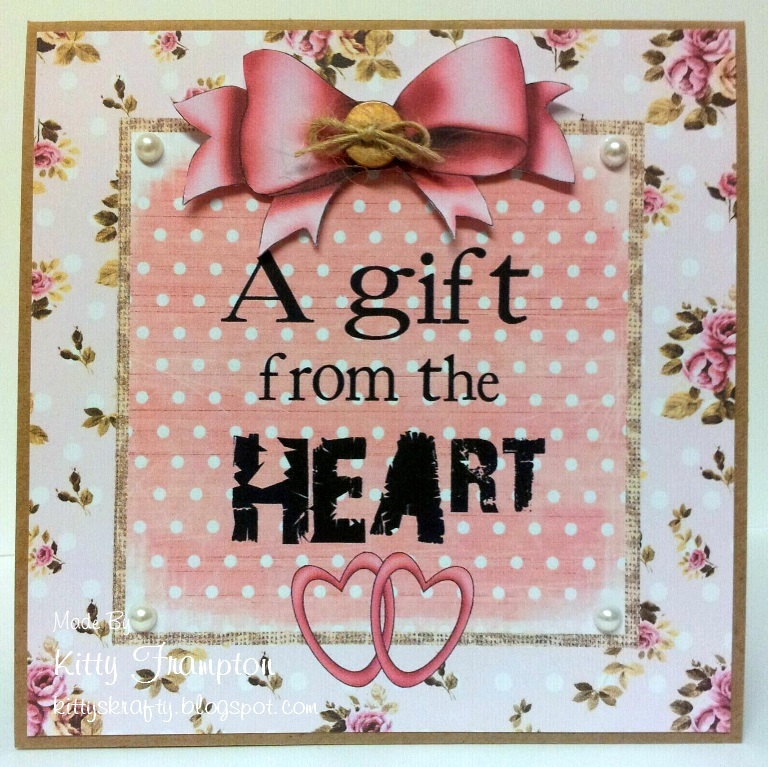 so I use all my digital products to create real, off the page or on the page projects and cards, simply mixed up with my chipboard, stamps and every other bit of stash I have. It simply means I can get LOADS more product at an absolute snip of a price - 100's and 100's of papers for me to print at home economically all for the price of a 48 sheet 12 x 12" paper stack. It's a no-brainer! And the great thing with Polkadoodles is that we WANT you to go hybrid so unlike most other digital brands, all our images will print out fantastic quality at home on your basic cheapo home printer with the cheapest inks you can find - cos we know that is what YOU want! So anyway, I love making tags and thought I'd share this one I made ready for Valentine's Day, which will be here in the blink of a Distress Ink! To make this I cut out a simple tag shape and covered it with paper from my Picknix collection and some lovely bits and pieces from the website - you can see in more detail how I made it over on my blog here. p.s. Dont forget that there is still a 15% sale on the website so make sure you grab a bargain whilst you can! Week 1 - Emma Canning Blog Hop FREE digi!